Plan Melbourne 2017-2050 identifies the future Toolern Metropolitan Activity Centre as one of 'state significance'. As a future or prospective resident of Ambervue, I would like to extend an invite from our local Council to come along and find out more about Melton's largest future town centre. Council is holding a Drop-In-Session to provide information to the community. A visit is highly recommended. Melton City Council is developing the Toolern Metropolitan Activity Centre and Employment and Mixed Use Urban Design Framework. An urban design framework is a detailed planning and design document that will guide the future development of the town centre. Right next door will be a future employment area featuring office spaces, warehousing, big box retail and light industry. Melton City Council recently commenced work in August, 2017 on the Toolern Employment and Mixed Use Urban Design Framework (UDF) and the revision of the adopted Toolern Town Centre UDF (2012). 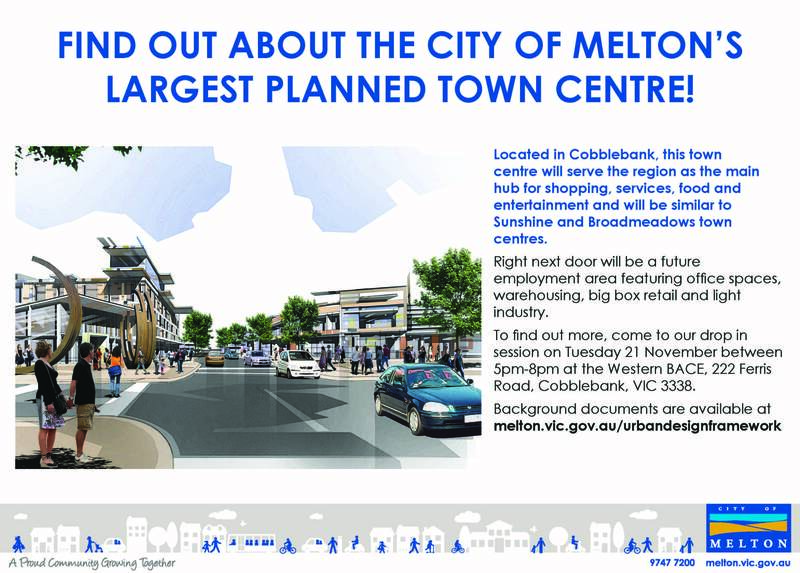 The Toolern Town Centre UDF is an existing document that was developed by the Victorian Planning Authority (formerly known as the Growth areas Authority) in consultation with Melton City Council. The existing adopted Toolern Town Centre UDF is required to be updated due to Plan Melbourne 2017 – 2050 (metropolitan planning strategy) upgrading the centre from a major activity centre to a metropolitan activity centre. Further information and background documents can be found on the Melton Council website. Council is seeking comments on the draft Background Report, with the closing date for submissions Wednesday 13 December, 2017.